The M700MD4, an ultra-rugged Android tablet, is built to withstand the rigors of harsh environments while maximizing efficiencies in field service, utilities, public safety, and asset tracking. With its integrated 1D/2D and optional RFID scanner, brilliant touchscreen display, powerful Quad Core Cortex A7, and long battery life, this lightweight Android tablet is ready to go to work. In the power department, the 3.7V 5300mAh Li Poly rechargeable battery appears adequate for this android tablet for 6 to 8 hours battery life. M700DM4 battery is user-replaceable on the back of the device. The barcode scanner is available as a built-in option for M700DM4, utilizing SE4500 high performance motion tolerant 1D/2D imager from Motorola. That scan engine features fast pulse illumination, a bright central dot for aiming pattern and it is capable of reading all common 1D or 2D barcode (QR Code / Data Matrix / PDF 417 /Maxicode / Aztec). On the M700DM4, the scan engine sit securely in our built-in housing, on the top right of the device for accurate aiming. 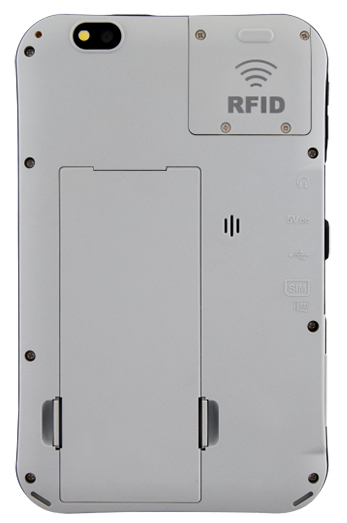 M700DM4-RF offers RFID versions snap onto the back side of the device, this 13.56MHz RFID reader supports ANSI/ISO14443A and ISO15693 Card type with detect range 1-3 cm. This makes the unit suitable for all sort of scanning or data collection process in wide range markets such as field service, logistic and warehouse or retail.